TEACCH’s Most Popular Training! 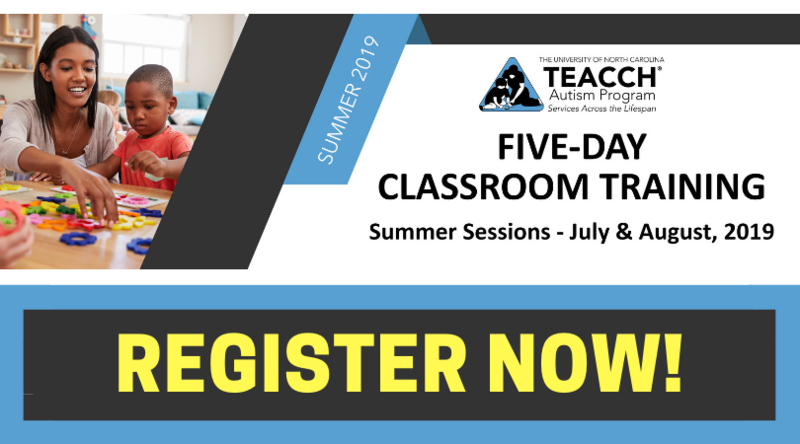 This five-day hands-on course provides a theoretical foundation as well as hands-on opportunities to assess and teach school-aged children with Autism Spectrum Disorder (ASD) in a demonstration classroom setting. The premise of this foundation is an understanding of the learning styles of individuals with ASD and how to use teaching strategies that capitalize on learning strengths. An emphasis is placed on the use of Structured TEACCHing principles to teach children and adolescents with ASD skills in the areas of academics (literacy and numeracy), communication, independence, social and leisure, vocational, relaxation and coping strategies. Participants will have an opportunity to apply these strategies with students of varying ages and functioning levels in a classroom setting and in the community. The training includes presentations, small group discussions, demonstration classroom activities and hands-on experiences for five consecutive days. Spaces fill quickly.